Huang, Y., Cui, G., Li, B., Zhu, X. and Yang, Z. 2018. Elevated atmospheric CO2 enhances grazer-induced morphological defense in the freshwater green alga Scenedesmus obliquus. Limnology and Oceanography 63: 1004-1014. Plants often invoke certain defense mechanisms to help fight off predators, which defenses, in the words of Huang et al. (2018), can protect plant species and "prevent strong population fluctuations and stabilize the structures of [food] webs." However, much remains to be discovered about how such defenses might be influenced by rising atmospheric CO2 concentrations, especially for aquatic plants, which have been studied far less than terrestrial plants. Hoping to obtain some insight in this regard, Huang et al. subjected a freshwater green algae (Scenedesmus obliquus) to culturing conditions of normal (390 ppm) and elevated (750 ppm) CO2 and the presence or absence of a grazer-derived cue (filtrate of Daphnia magna). It was their hypothesis that elevated CO2 would reduce the energy demand of photosynthesis, thereby increasing growth and freeing up energy to be utilized in enhancing grazer-induced morphological defenses. The results of their study showed that elevated CO2 did indeed increase algal photosynthesis, stimulating the growth rate of S. obliquus by approximately 13% in treatments with or without the predatory cue (see Figure 1). Huang et al. also report that elevated CO2 enlarged the volumes of unicells and two-celled algal colonies and promoted the formation of larger colonies (four- and eight-celled) in response to the predation cue. Consequently, in the words of the authors, "the grazer-induced colony formation in Scenedesmus was enhanced by elevated CO2, thereby promoting a morphological shift toward eight-celled colonies." And these positive findings should not only benefit S. obliquus, but help to further stabilize the aquatic food web it sustains! Figure 1. 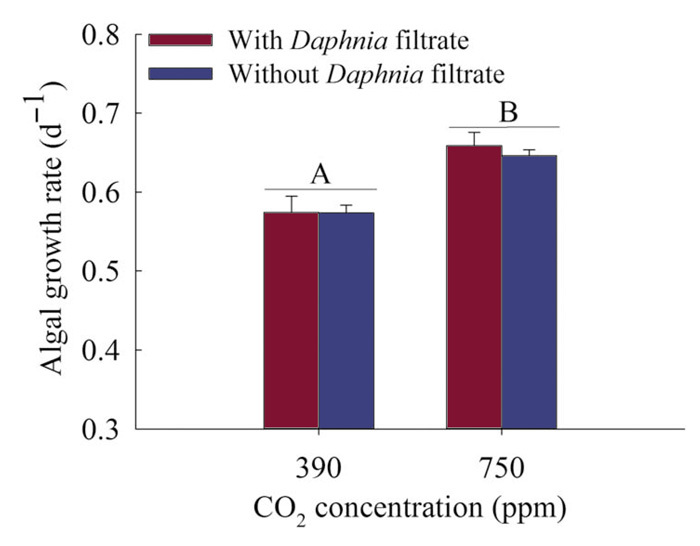 Growth rates of S. obliquus grown at an air CO2 concentration of 390 or 750 ppm in the presence or absence of Daphnia filtrate. The different capital letters above colored bars denote significant difference between populations growing at 390 ppm and 750 ppm air CO2 at p < 0.05. Source: Huang et al. (2018).